Gamecards deliver Exciting rewards, Big Cash, and Huge Drawing Chances. Proven successful in both large and small organizations. PROVEN TO ERADICATE ACCIDENTS IN MOST INDUSTRIES, IN OVER ELEVEN COUNTRIES. THIS SAFETY INCENTIVE PROGRAM IS THE WORLDS BEST. WE CUSTOMIZE ALL PROGRAM COMPONENTS TO FIT YOUR EXACT NEEDS AND BUDGET. This safety incentive / recognition program is very different from the rest. Most incentive programs are centered around the safety or wellness reward itself. Over 65 years in the business has led us to the secret. Unless your Safety award budget is giant, Lowering accidents, grabbing employee attention and creating safety awareness is achieved by hype, promotion, employee interaction and involvement. Peer pressure, team involvement, and offering both individual award recognition and sweepstakes type awards makes the difference. Our safety incentive gamecard system accomplishes all of this in one easy to administer program.Take a close look! Safety incentives have never been so much fun! No, OSHA has not banned safety incentive programs. OSHA recently clarified their previous statements on safety incentive program. Check out this ISHN article for more information. Safety Incentive Programs must be designed for maximum accident reduction while making sure all accidents are reported. Accident Hiding is a non-issue with Safety Jackpot. Our OSHA Compliance incentive consultants will help you create a program free of accident hiding. Our flexible rewarding vehicle of a gamecard allows for frequent smaller rewards given out for specific safety behavior. 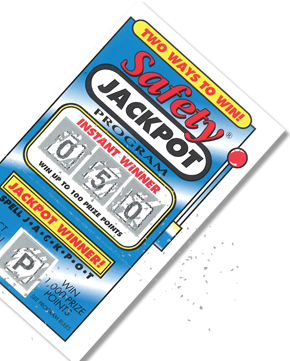 The Safety Jackpot gamecards are handed out weekly to employees for safe behavior. We help your chose gamecard incentive criteria that is attached to your specific safety initiatives and needs. Every company is different. We choose criteria that has been proven with thousands of other like clients. Focus on your job not the incentive program. Newsflash- “Your job is not to be a promoter, cheerleader, or program administrator….. that’s OUR job!” This program has been proven to be basically administratively free. 61.9% WITHIN ONE YEAR AVG. Ok, it’s true. You will not find another safety incentive program that has been proven for decades with a 62% Average accident and cost reduction. Try the program today. Most of our clients find that getting budget approval for this safety incentive program is easy. Our safety incentive consultants will work with you to create a return on investment analysis. This generally shows that the program will pay for itself in short order. Most achieve a 5 to 10X return on investment at the one year point. How bout that for an incentive!